"The charm in this book is that it's so much more than an opening manual. I liked turning the pages with a childlike feeling of 'what wonders am I about to uncover'. Inside you can find anecdotes, quotations, comparisons, discussions about the pawn structures that might occur, and plenty of Swedish humour." 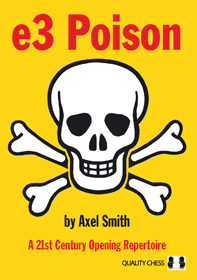 e3 Poison will prove most useful for players 2200 on up who can handle the many transpositions and different middlegame pawn structures that arise." "Overall, the book is a must for all experienced chess players who like the closed openings and want to expand their understanding of them. I found reading it a great pleasure and I read it almost in one go. GM Smith will hopefully write a lot more of such great chess books!"